My earliest memory of my Aunt was probably in the back of her sweet shop in Hastings Old Town, I remember her giving me a blue heart shaped box with a man’s ring inside, she told me the stone in it was a diamond but I always doubted that for some reason. She moved to Canada while I was still very young and I didn’t see her again until I was an adult, she came over to visit my Nan, it was a lovely visit and I got to know her again, I remember one awkward conversation where she asked me about girls and said men have needs, I squirmed a bit at this as I’m not one to talk about these things especially with family, she said she would find me someone although I lied and said I was okay alone. Shortly after this visit she had problems with her husband, using caring for my Nan as a reason she returned to England and never returned to her husband. After a while my Nan decided to move to Cheltenham to be close to me and my Mum, my Aunt came with her and they managed to get the ground floor flat next to ours. We spent many years all doing things together and sharing our lives. After Nan died my Aunt remained next door, I had expected her to return to her family in Canada, but she was happy here and had us to keep her company. In 2014 my Aunt’s voice began slurring, we became concerned that she may have had a stroke but her GP didn’t seem to think so and wasn’t overly worried, the slurring became worse over the next few months and she became more exhausted so her GP eventually referred her to a neurologist. In November of 2014 my Aunty Jen, Aunty Cyndy, Mum and myself went to her neurologist appointment at Cheltenham General hospital, I waited outside while the sisters went in and talked to the neurologist. After some time my Aunt came out, eyes red from tears, bent down and said “It’s Motor Neuron Disease”, it was a shock but to be honest I didn’t know much about it and was relieved she didn’t have a brain tumor, my Aunt knew though and I could tell the pain and fear she felt inside. At Christmas I felt a change in her, something was different, she knew the end was close and didn’t want to suffer, I had expected her to live a year or longer her being a rather stubborn woman, but I knew then that this would be her last Christmas. We attended other appointments together, the final one was to get a ventilator, she was pleased with it and actually perked up for maybe a week, but then, suddenly, things got worse, within a few weeks she could barely speak and needed help moving from one room to another. Her last week she remained mainly sitting in her chair or laying in bed, her communication became almost non-existant, we got carers in to help my other Aunt, who had stayed since November to look after her, and on Saturday the 14th of March at about two am I heard my bedroom open and My Mum say “She’s gone”. I barely slept for the rest of the night, an emptiness clutching at my chest and thoughts of my Aunt swirling in my head, in the morning Mum told me that my Aunt had had a few moments of panic but then calmed, she sat in her chair with my Mum and Aunt holding her hands and passed away surrounded by love and family. My Mum, Cynthia, was born on Nov 23rd 1943 to Fred and Olive Baker and was the eldest daughter of seven children, this was where her love for children and caregiving began. Mum experienced the first of many operations at five years old, there were countless further trips and stays in the hospital through her entire life. When Mum finished school she joined the army which she enjoyed and found it suited her well, there she met and eventually married my Father Ed Tuckey. In March of 1963 they had a baby boy named Paul, Mum adored him and loved having her own child, Mum then had another beautiful baby, Andrew, Andrew sadly passed away from crib death at only 6 weeks old, it was a death that crippled her for many years and something she never really came to terms with. My parents then decided to adopt, and Janine and Sara joined the family in 1971 and 1974 respectively. This completed their family and they began moving with the army to different places in England, Europe and the Middle East, they were eventually posted in Canada which they loved and after Ed completed his term with the army, they immigrated there. By this time Paul had married so it was just me and my sister with them. Mum was never afraid of hard work and my parents had many business’ including a Taxi service and a Sweet Shop in Hastings, so they decided to buy a general store and began a new life in a new country. Mum missed her family and many long letters were written, having children of similar ages had brought Mum and her sisters closer in adulthood, the distance was far but they kept in touch. My Grandmother even made the long journey to visit her in Canada. The business closed and as the girls had moved out the couple moved to Canmore, then Banff which she loved, It was beautiful there with stunning mountains and a fast paced lifestyle. Mum returned to work in a hospital setting caring for seniors and thrived. Paul came to visit and brought her two granddaughters with him, she adored having them. By 1991 her marriage was over and she had had another granddaughter, she was present at the birth and made a special connection with Chelsea who became the apple of her eye. My Mum struggled with mental illness on and off for her entire adult life and finally in Banff found a suitable treatment, her life became more settled and she was happier. My sister Sara came to live with her and Mum met another man, Ray. Sara gave birth to a baby boy and mom adored him, when Sara gave him up for adoption that loss affected her once again. Ray and Mum moved to the east coast and were married in 1996. Mum made numerous trips back and forth across the entire country to see me and Chelsea and her first grandson Austin, born in December of 96. The coastal life she loved, and it renewed her yearning for England and her family there, her marriage dissolved and she returned home to England and her mum. Sara had already returned and Paul was close so she was very happy to renew all these relationships. Mum stayed with my Grandmother and continued her caregiving by taking care of her mum. She journeyed with her mum back to Canada in 2003, and they continued to make excursions in England enjoying special times together. They took a memorable trip to Hastings to see their family home. I married in 2003 and Mum made the journey back in 2004 to see the birth of her 6th grandchild, Mum continued to trek back and forth to Canada to see two more grandsons, her granddaughter Chelsea’s graduation and her first great granddaughter, as well as just some intermittent visits. 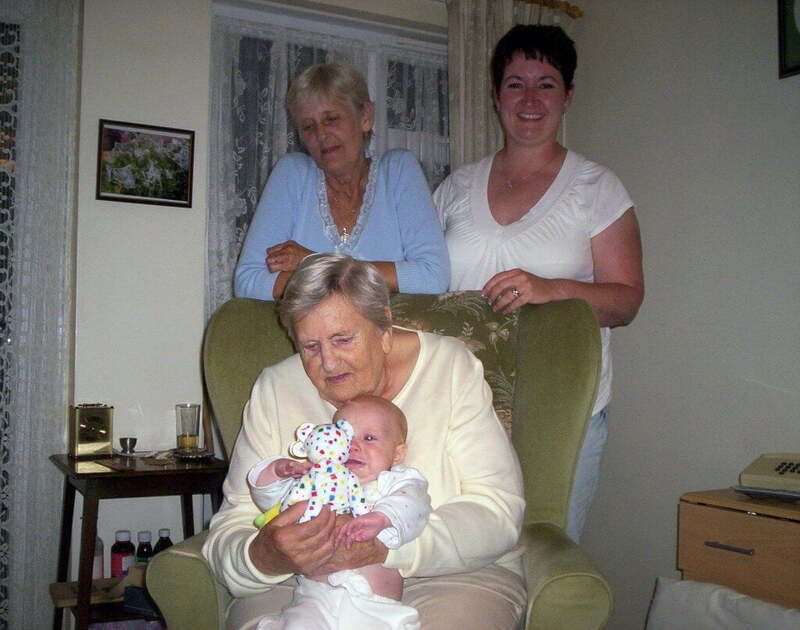 In 2007 Mum suffered the loss of her youngest daughter Sara in August and her Mum in October. She was devastated and returned to Canada for Christmas. It was the last time she would return to Canada in the winter and see the snow she loved. Mum remained in the home she had made with my Grandmother, she settled into a very content life, surrounding herself with her beloved pets and shared a special bond with her sisters. Her Granddaughter, Chelsea, came to visit her at the beginning of 2014 with both her great granddaughters as her health had prevented her from traveling. This was a wonderful visit, unfortunately this was also the beginning of her health decline. Her sister Jennifer came to visit in October of 2014 and never left her, I came to visit a couple of times and spent some very special time with her, Chelsea made it to see her again and spent a wonderful week with her at the beginning of March. Her son Paul came on Wednesday the 11th and Cynthia passed away at home with her devoted sisters by her side on March 14th 2015 at age 71 years. Mum was a wonderful mother and sister and a devoted daughter, she was also a special “Aunty Cindy” to her nieces and nephews who she grew to know better when she returned to England. She was a champion of the underdog and an advocate for those who needed a voice. She loved animals and through her life had numerous pets, countless strays and even a monkey that became a member of the family. Mum was the original “gamer” and loved electronic games, especially Mario, numerous times she sat to play a quick game and lost an entire afternoon. She worked hard at whatever she did, and was not afraid to learn and continued to learn all her life, she continued to spend afternoons on her iPad playing games. Mum had strength beyond measure and had endured tragic losses with a quiet manner. She loved beautiful things, and enjoyed gardens, she enjoyed tending hers and it gave her great pleasure to watch it grow. In the twilight of her life, she enjoyed a simple quiet contentment, caring for her beloved dogs, sharing a special sisterhood which included much laughter, and enjoying her neighbourhood. She will be dearly missed by all who knew her, family and friends. She will be fondly remembered as a “lovely lady” which she has been called numerous times. I will never forget my Aunt, she didn’t deserve such a disease, no one does, but I am glad she didn’t suffer for long. There were many tough times during her illness for me, telling her Granddaughter in Canada she needed to come earlier rather than later to see her, letting her daughter know she only had days at most, seeing my Aunty Jen almost breaking down with the stress and heartache of looking after her, although I am also so proud of her, she’s always been so kind and feels everything with her heart, in these last months she grew to become strong and put my Aunty Cyndy before anything else. Motor Neuron Disease is cruel and has cost me more than just the heartache of losing an Aunt, I looked at her and her symptoms and saw Duchenne and my mortality staring back, I fear my disease more than ever now and am unsure of myself, I haven’t achieved what I want in this life, I have no family of my own, I only have few moments of happiness, I have no plans for my future, no goals except to live and never give up. An aunt adds beauty, joy and love to life. Only an aunt can give hugs like a mother, keep secrets like a sister and share love like a friend. Aunt, you’re forever in my heart. A wonderful aunt, a special friend on this we both agree, so much a part of lovely times we keep in memory. God couldn’t be everywhere so he created Aunts. A garden of love grows in my aunt’s heart. There are angels walking on this earth disguised as aunts. Aunt, may your heart be filled wilth light and love, may your life be touched by beauty, and may your home be warm with happiness. Everything is nicer when shared with an aunt. This entry was posted in Uncategorised and tagged Aunt, Canada, Cyndy, Hastings, MND, Oxford, Tuckey. Bookmark the permalink.